If you have ever worked in wet, cold weather with drenched gloves that merely protect soggy fingers from the gusty winds, you’ll know what I mean when I say it is uncomfortable. You know that feeling that your hands are stuck in a bowl of ice water, and it seems like nothing will cure the biting sting of cold. It takes time to thaw and dry. Not in a moment, but after using a dry towel and creating friction by rubbing your hands together and a nice fire as the slight change in temperature over time will eventually do the trick. Oregon football could be summed up with such an analogy. After starting the season with three wins to their three losses, the team was at that point of the biting sting and heavy sogginess that made the rest of the season look challenging, at best. That same team suffered through the labor of injuries and early lumps of the young, inexperienced secondary and stepped inside near the fire. There was hope of relief and a sense of a spark nearby to feel the flames. 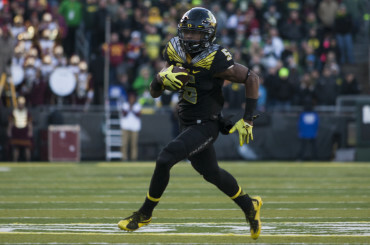 A tale of two halves of the season — the Ducks put in work to improve. Week by week, Oregon improved its defensive play and the offense began to open up the playbook. The final six games were highlighted by two major wins against a Top-10 Stanford team in Palo Alto and a huge home stand against the mighty Trojans of USC. The feeling came back in the hands and the creaking in the bones had stopped. Oregon won the final six games and redeemed what seemed to be an endless heaviness of spoiled fans ranting about whose heads should roll for such a downslide. It took time to thaw and warm up and become the team we knew it could be. We saw the beginning of the final six games with spread fingers over our eyes peeking through the cracks. We celebrated each victory with a sigh of relief and felt increasing confidence in the next. Dennis Dixon, Josh Tschirgi, author and Garren Strong visiting for the USC game. I attended the meeting between Oregon and USC and noticed how many of Oregon’s ex-players made it to the game. The obvious, Marcus Mariota was on the sideline with the players and coaches due to a Thursday night NFL game. Joey Harrington made an appearance on the field representing the Harrington Family Foundation. Another quarterback I spotted who was not brought to the attention of the whole stadium was Dennis Dixon. I actually met Dixon and a few of his friends he played next to (or behind in the case of one of his offensive linemen, Josh Tschirgi), who hadn’t seen Dixon since his departure to the NFL. The reunion was wonderful to witness. I saw a handful of receivers who had their moments of stardom in Autzen Stadium including Cy Aleman, Garren Strong and Samie Parker. It was like a celebration before the game. Samie Parker, author and Cy Aleman before the big USC game. These past players know how big the USC game is each year and all of them had high hopes that Oregon would definitely come out on top. 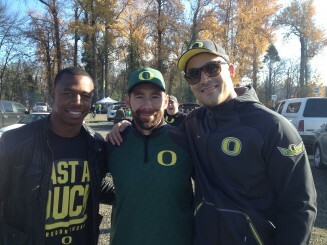 It’s like these guys are speaking from the dust or bringing the past greatness into present and future Duck greatness. 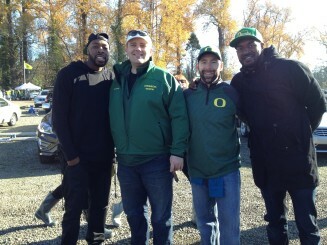 I also had the pleasure of picking the mind of former Oregon safety Michael Fletcher regarding some recruiting information. I wish he could have spent more time with us but he’s a busy guy. FishDuck.com‘s Dave Melo wrote an article about him almost four years ago. You can read that here. Beating USC by 20 points that day may have prompted nostalgia about the Ducks of old. This was a huge turnaround since the Utah game when nothing seemed to go right. I noticed the same trend of development in recruiting as the football season continued. After two defectors, Jared Mayden appeared to be the next to withdraw his allegiance to Oregon with words that suggested he needed to think things through after his official visit to Eugene. Taj Griffin is an exciting true freshman from Georgia. It was Bryce Young’s commitment and Mayden with his bold decision to stick with his gut feeling and re-commit to the Ducks that turned the recruiting momentum upward again. Since then, a Washington Husky legacy Eric Briscoe, Jr. received a scholarship offer and jumped on it immediately. Taking anything away from the Huskies is a win! 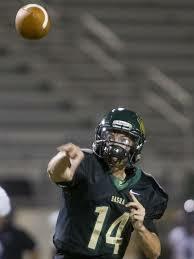 Briscoe then became one of the nine athletes to sign an early financial aid agreement to Oregon. Nine of the current 16 firmly-committed players plan to enroll early for the winter semester to be available for spring drills. Of course, the financial aid agreement is not binding like the letter of intent, but it definitely solidifies a commitment to one school. A few of the early enrollees were not so surprising, such as Briscoe, Troy Dye, Jacob Capra, Hunter Kampmoyer and maybe Cam McCormick. The two surprises were Darrian Franklin and Dillon Mitchell. Franklin has recently seen some increased interest from other suitors and he is taking other official visits, so hopefully the financial aid agreement will keep him focused on Oregon. The final two are JUCO linebacker AJ Hotchkins, and Terry Wilson (who is the first athlete from his high school to try early enrollment, so the counselors had initial trouble getting things in order). Mitchell has seen interest from many SEC schools, and he is arguably the best high school wide receiver in the state of Tennessee with a superb highlight film to prove it. To say Oregon has gained some swagger by keeping this kid is an understatement. It seems Mitchell averages five touchdowns a game. Sounds like he belongs in Oregon. Having Hotchkins come in early at a position where depth is needed is huge for the Ducks. 2017 looks bright with Ryan Kelley committed to Oregon. With all the poor perception of the decline in quarterback talent for the class of 2016, good news arrived in way of a verbal commitment from the top non-committed pro-style QB in the class of 2017. Ryan Kelley is the No. 3-rated pro QB according to 247sports.com. He plays in Arizona against some of the top high schools in the state. His confidence, abilities and desire to have talent around him will help the Ducks recruit for the future. I watched his highlights a few times and not only can he make great throws, but he is definitely mobile in the pocket and runs some option packages. Oregon is a great fit for Kelley’s talent. After the team brought things together and played well, future stars continued to make their pledges to Oregon and this gives us positive momentum moving forward. 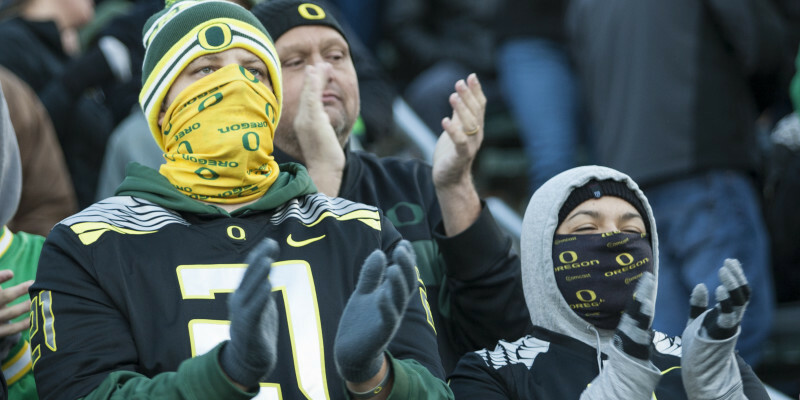 Oregon is looking forward to having big-time official visits from highly touted prospects in the next two months. This weekend, Lamar Jackson announced that he is heading to Eugene. Jackson is a 4-star safety from Elk Grove, Calif. His 247sports Crystal Ball has him projected 100% to USC. With head coaching changes for the Trojans, there might be a chance for Oregon to impress and sway him to make his home in Oregon. On a side note, Jackson has taken all of his official visits and will pay for this visit on his own dime along with 7-on-7 buddy Josh Falo from the 2017 class. Falo already has an offer and would be a great athlete for the Ducks to pick up to be the next great linebacker. Lamar Jackson will be in Eugene this weekend. Another visitor for the weekend appears to be hot and cold. This may be due to the departure of Scott Frost to become the head coach for UCF. It is said that coach Lubick is excited about the potential of Eddie McDoom. This trip may be just what McDoom needs to make his commitment to Oregon. Also, JUCO offensive lineman, Tyson Rising will visit this weekend and may end up getting an offer and likely committing after Oregon missed on Garrett Bolles. I would love to see Scott Lashley added to this spot. He has great size, is very level-headed and willing to look at all his options. 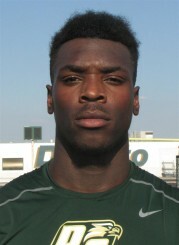 Lashley will visit Oregon in January but the addition of any one of these would give the line a great boost in depth. Justin Hopkins and Matt Prehm at Duck Territory broke some information early this week regarding another visitor for this weekend. Montana State’s quarterback, Dakota Prukop, maybe the next QB transfer similar to last year with Vernon Adams. FishDuck.com writer Mark Flores covered this topic in more depth in his recent article with a link to Charles Fischer’s analyst on Prukop. Click here to read more. Tristen Wallace is an elite QB from Texas who may flip from Ohio State. Maybe bigger news that took a while to develop and came out shortly after the Prukop news is that another QB has interest in Oregon for the class of 2016. Four-star Tristen Wallace from Texas, who has been committed to Ohio State since April, is having second thoughts about the Buckeyes. 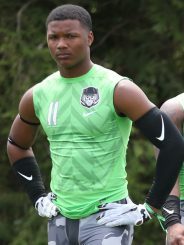 Maryland QB commit, Dwayne Haskins Jr., is taking an official visit to Columbus and seems ready to flip to OSU. Wallace is not only looking at Oregon, but UCLA this weekend as well. This makes the QB options pretty crazy now. 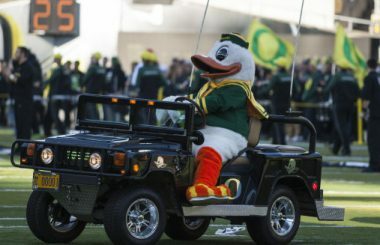 January is coming and that’s when Oregon traditionally does its best closing for signing day. It’s going to be a great class!